The One Hour Advantage | Coburn Technologies, Inc.
For free-form and conventional lenses. Novar Free-form Lens Designer has been in development for over seven years. 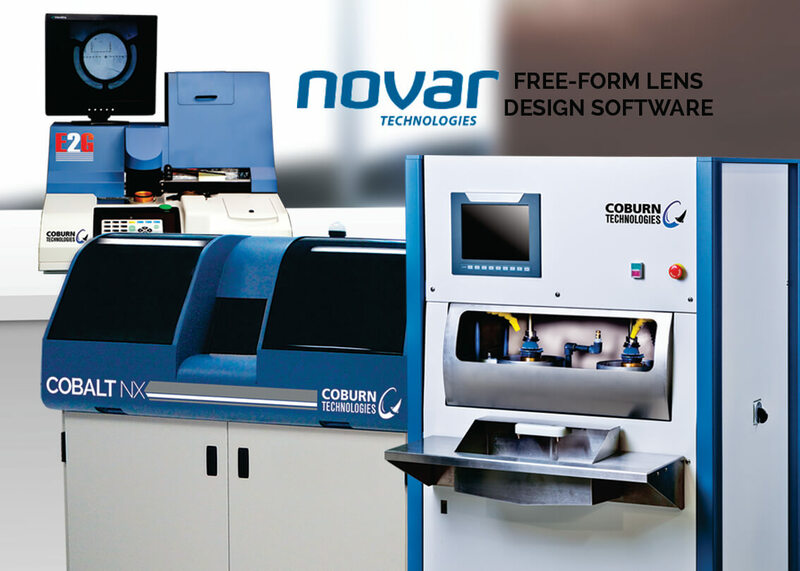 Successfully utilized on tens of thousands of lenses, Novar can be implemented on a broad variety of laboratory management systems and surfacing platforms, including Coburn’s Cobalt System, as well as those of other major equipment manufacturers.There’s a 30-day trial available for anyone interested in testing the product on a risk-free basis. Learn more. The eco-friendly E2G surface blocking system consists of the E2G blocker, new surface blocks, a deblocker, and a proprietary environmentally safe medium called Onyx-Bond™. Onyx-Bond is the heart of the E2G blocking system. As a reusable, machinable, and biodegradable blocking material, lens laboratories worldwide will benefit from the use of this material for processing all conventional and digital (free-form) lenses. Learn more. Coburn’s Cobalt NX Lens Generator continues to push the limits to produce superior quality lenses in terms of form and finish. Building on the Cobalt heritage, the new generation Cobalt NX incorporates a number of enhancements including a linear motor and an integrated spindle to provide extra precision and more accurate lens geometry. Learn more. The COBALT lens polisher utilizes 4 Axis of motion control when other optical polishing machines use only 3 Axis providing the user with the ability to control, move, and manage the lenses with greater speed, accuracy and variation (almost infinitely) than any other system. This gives the COBALT the ability to change how it polishes during the process. Learn more. The Eclipse LX surface blocking system offers standard layout and blocking features, along with advanced blocking applications that will enhance any ophthalmic laboratory. With its automatic one-touch blocking feature, operators block and chill the lens in one simple step, consolidating the surface blocking process, while increasing throughput. This economical surface blocker dispenses the patented Free-bond blocking material, a proprietary blocking compound designed to be environmentally-friendly. As with Onyx-Bond™, Free-Bond eliminate the concerns associated with alloy blocking. Learn more. Continuing with the SGX series’ great reputation, the SGX Pro provides progressive labs around the world with proven, high performance cutting technology for CR39®, hi-index, and polycarbonate lenses. Based on the SGX Plus Platform design, the SGX Pro Surface Generator is equipped with new electronics operating on a Windows 7 platform. Its user interface has been upgraded and includes a touch screen monitor. Coburn provides a SGX Pro Upgrade kit for SGX Plus users looking to modernize their equipment. Learn more. The Acuity Plus Polisher and Finer offers a number of options and user benefits, making it the most flexible cylinder polishing machine on the market. 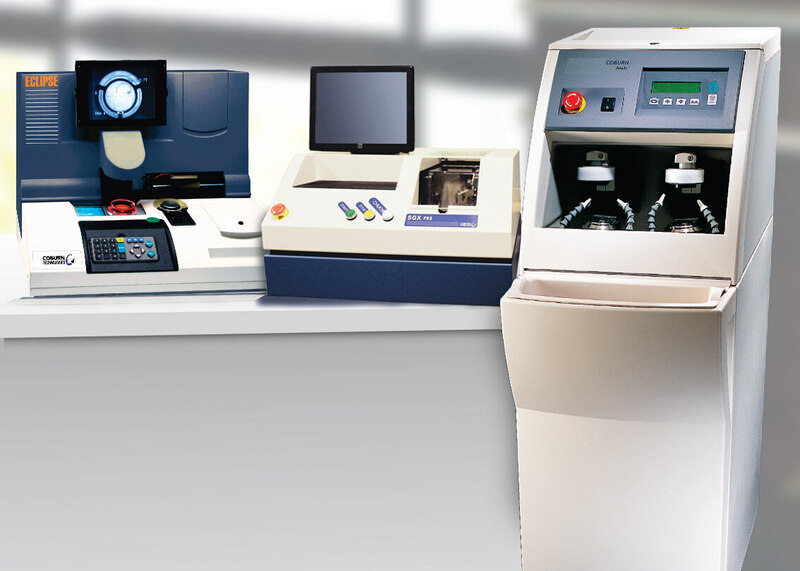 A sophisticated yet user-friendly and highly economical optical laboratory tool, it generates exceptionally accurate lenses by selecting the best lens processing times and pressures in accordance with the specified lens material: CR39, polycarbonate, hi-index or glass. This degree of precision is supported by a mechanical design providing optimized fining and polishing orbits. Learn more.